German Chancellor Angela Merkel and French President Emmanuel Macron have agreed to create a eurozone budget charged with boosting investment in the currency bloc and promoting economic convergence between its members. Speaking at a joint press conference on Tuesday, Macron said the new joint budget would be operational by 2021. The French president said details of the budget, including its amount and whether it would be financed by national sources or a bloc-wide tax, would be decided by ministers before the end of the year. "We are opening a new chapter," Merkel said. "We are working to make sure that the eurozone budget will be used to strengthen investment, also with the aim of strengthening convergence within the eurozone." The comments came after the two European leaders met at Meseberg Castle, outside of Berlin, for talks on European reform ahead of a June 28-29 European Union summit. Ahead of the announcement, French Finance Minister Bruno Le Maire said failure to reach an agreement on reforming the eurozone would spell trouble for the single currency bloc and the wider EU. 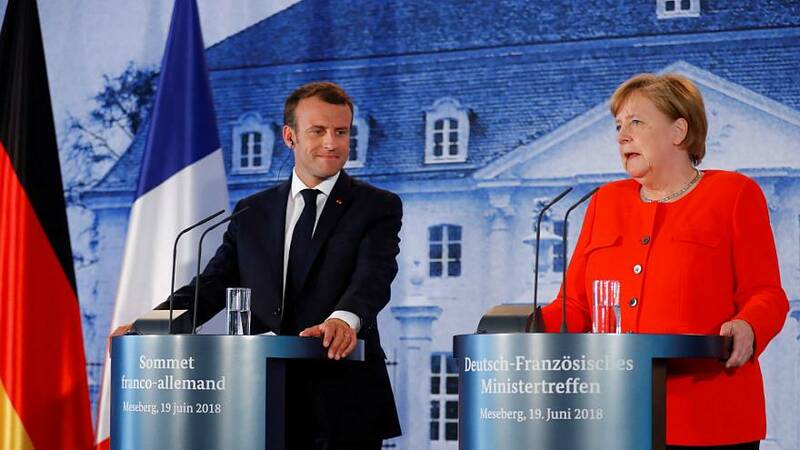 “This is the moment of truth for the Franco-German relationship, the hour of reckoning for the future of the eurozone,” he told BMF television.